Emory’s new critical care vehicle, created in partnership with MetroAtlanta Ambulance Service, has a customized interior that includes special equipment and expanded seating to accommodate the team needed to care for ECMO patients. 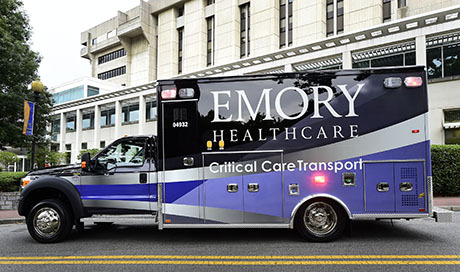 Emory Healthcare is putting a new specialized ambulance on the road to transport critically ill adult patients who require extracorporeal membrane oxygenation, or ECMO. "ECMO works by replacing the heart and lungs, pumping blood in-and-out of the body, while removing the carbon dioxide and oxygenating blood," says James M. Blum, MD, chief of critical care for the Emory Department of Anesthesiology and director of the Emory ECMO Center. "It allows life saving time essential for the treatment and recovery of the lungs and heart." "In the past, ECMO has mostly been used on children but the technology is being used more frequently in adults with cardiac and respiratory failure," explains Blum, who has treated hundreds of ECMO patients and is recognized as a national leader in critical care. Proper transportation of ECMO patients requires a larger care team of at least four people, each with specialized knowledge and skills, versus two care team members in a regular ambulance, so additional seating was necessary for the unit. The vehicle also contains dedicated equipment for monitoring and lifting the patient because of the complexity of their illness and weight of the equipment. "For patients with severe cardiac or pulmonary failure who require transport to a specialized hospital like ours for advanced medical therapy, transportation can be a difficult and dangerous problem," says Bryce Gartland, MD, chief executive officer, Emory University Hospital. "With the addition of this customized vehicle, Emory University Hospital is the only adult ECMO center in Georgia and one of the the few in the country offering specialized transportation services from a referring hospital to an ECMO Center," says Gartland. The Emory ECMO Center is a leader in adult extracorporeal life support providing excellent clinical services in addition to a robust research base. It is the premier ECMO center in the Southeastern United States and uses a collaborative, multidisciplinary, team-based approach for the management of ECMO patients.